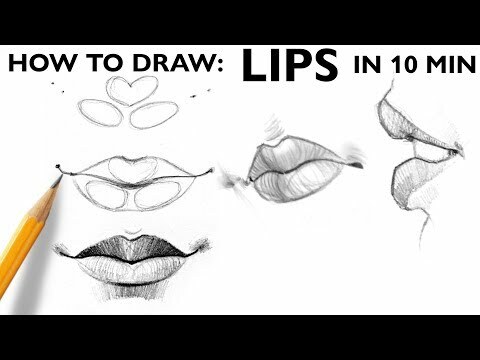 Hello guys, in this tutorial I'll show you how to easily draw lips from your imagination. These two points marks the mouth angle. To feel comfortable with this process, draw these steps once again. Connect the upper and lower lip with an outline. Take your time and draw these steps once again. With these lines you'll give the lips some volume. Your drawing automatically takes shape. Add a little bit of shading into your drawing. Take care that the upper lip is a bit darker than the lower lip. Define the connection between lower and upper lip with a soft pencil. Shading the mouth angle gives your drawing more realism and makes it look more believable. and where shadows are appearing. If you don't feel comfortable, try to shade all of the three shapes seperatly. Test your improvements and try to draw lips from different angles.